Every country has a national dish to boast of — Singapore is famous for her Hainanese Chicken Rice, Thailand is famous for Phad Thai, Myanmar for Mohinga. Taiwan is no exception — but good taiwanese fanfare is hard to find in Singapore. 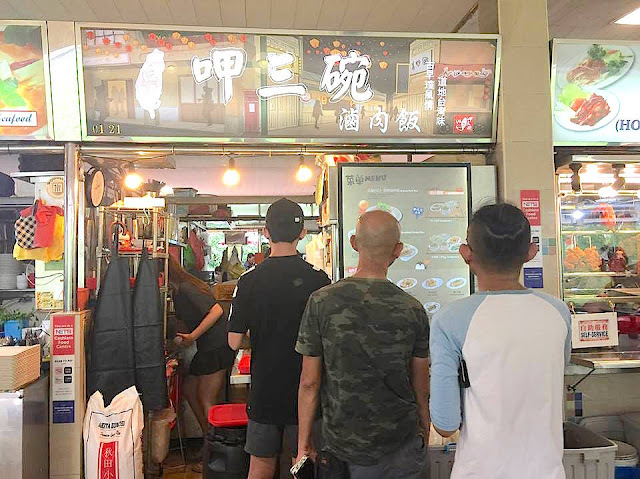 One famous place for those who needs to get their taiwanese dish cravings satisfied is "Eat 3 Bowls" at Seah Imm Hawker Centre. Eat 3 bowls just celebrated their 2-year anniversary in January. The cousin duo first started out with 3 signature dishes - Braised Pork Rice (Lu Rou Fan), Intestine mee sua and another dish that is no longer on the menu. The braised pork rice is almost like the actual taiwanese version. I like how it's a healthier version — there was visibly less fats and the gravy was not as salty. The eggs felt like it was cooked for a long time though. It'd not be something that I will purposely travel for, but good-to-have when nearby. Hands down to the Intestine Mee Sua. All of us at the table agreed that it was amazing. The sticky gravy enhanced the texture of the vermicelli while the pork intestine was clean and odourless.